There are various types of evaluations but two main philosophical approaches: formative and summative. After a brief introduction to these two approaches, we shall share several specific types of evaluations that fall under the formative and summative approaches. Needs assessment determines who needs the program, how great the need is, and what might work to meet the need. Structured conceptualization helps stakeholders define the program, the target population, and the possible outcomes. Implementation evaluation monitors the fidelity of the program delivery. Process evaluation investigates the process of delivering the program, including alternative delivery procedures. Were your program objectives met? Will you need to improve and modify the overall structure of the program? What is the overall impact of the program? What resources will you need to address the program’s weaknesses? Summative evaluation will enable you to make decisions regarding specific services and the future direction of the program that cannot be made during the middle of a program cycle. Summative evaluations should be provided to funders and constituents with an interest in the program. Goal-based evaluation determines if the intended goals of a program were achieved. Has my program accomplished its goals? Outcome evaluation investigate whether the program caused demonstrable effects on specifically defined target outcomes. What effect does program participation have on students? Impact evaluation is broader and assesses the overall or net effects — intended or unintended — of the program. What impact does this program have on the larger organization (e.g., high school or college), community, or system? Cost-effectiveness and cost-benefit analysis address questions of efficiency by standardizing outcomes in terms of their dollar costs and values. How efficient is my program with respect to cost? 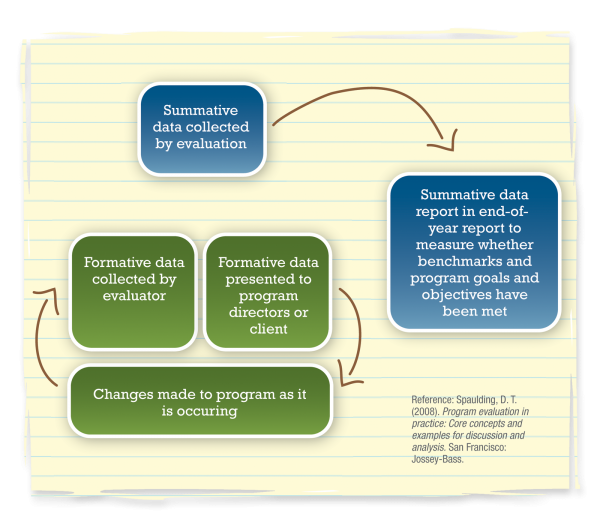 Below is a figure depicting the different ways formative and summative evaluation can be utilized.